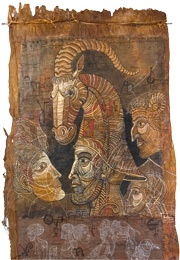 The collection of murals, etchings and lithographs might better be described as “The Carnival Ride We Call Stoiov's Brain" since, unlike many artists who paint only what they see or who deal in sheer abstractions, Stoilov filters both such sensory perceptions through the exotic baggage of his mind. A contemporary Bulgarian painter and lithographer, Stoiov was born in Varna, Bulgaria, in 1944 and grew up on the coast of the Black Sea. He graduated from that country's Academy of Fine Arts and is now a resident of Vienna, Austria. His works are exhibited in many public and private collections throughout the world, and they display a paradoxically futuristic interpretation of the mysticism and mythology appropriate to both eastern and western Europe. Bookended at either end of the Lyman Allyn's McKee and Chapel Galleries are two of Stoilov's massive murals. Along with a third, displayed at the top of the stairs leading to the exhibit proper, these murals serve as stylistic sentinels for the show. Actual rollable canvases, the murals appear; through the artist's skill and technique, as though they're actually frescos painted on some decaying wall certainly not found in the likes of Mystic or Darien. "Aged" through faux graffiti. cracks and coffeelike stains, the canvases are also fully realized and compellingly colored studies of various recurring motifs and allegories that pepper the smaller works comprising the rest of the collection. In companion pieces like the three lithographs in the "Mythology" series, there is a fantasmagoric discipline, as gleeful as it is ordered. The larger painting 'Pandora" adds to the nervous fl'enetlcism with the suggestion of motion in stuttered images. On the other hand, Clearly, some of the early, smaller works are at least in part studies for the murals that came later. It's interesting to see how the fragmented ideas actually blossom years later. 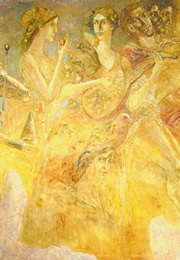 It should also be mentioned that, in addition to his skill at rendering characters and objects, Stoilov's mastery of lithography where, for example, with a simple, pale yellow wash and a few inspired slashes of red and gray, he suggests whole worlds of color that aren't really there is extraordinary. 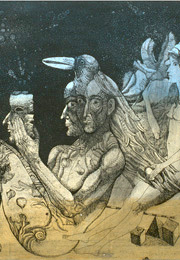 And what of the strange animals that seem to pervade so much of his earlier etchings? 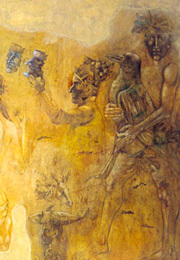 Like that of other contemporary masters, Stoilov's work sometimes takes its inspiration from more primitive cultures he has, in fact, visited aborigines in Australia where the experience of the tribe seems at once most simple and most profound, where the human river seems to run its deepest. The paintings come magically alive like the beasts on the walls of the caves of Lascaux in the firelight. We may have no idea of what language our primitive ancestors may have spoken, though the images they created to "name" the beasts, or bring them down, tame'or even worship them haunt us still. In Stoimen's work we are entranced by the creatures' bright eyes, so tender and strange, that seem to look on with such wonder and pity for the evil man does to man in the name of authority. the geometric forms of a picture, a diptych or triptych, to let themselves go freely in movement, in the conquest of new imaginary landscapes. Stoimen Stoilov's skill in artistic tones transgresses the law of the visible and the known to explore the infinite spaces of what constitutes our life on earth. This original vision is always accompanied by a humorous dimension which subverts the pompous side of all artistic creation. Sto'ilov's graphics, though minutely and richly elaborated, do not take themselves seriously. Stoilov follows rather the dramatic and creative elan of visual tension which links the real to the fantasmagoric, the serious to the absurd, the literal to the imaginary. Thus, his works acquire a symbolic dimension due to the thickness of the suggestive visual elements. Thus originality is created, a new style is born, and a new trend is fashioned. Stoirnen Sto'ilov varies infiriitely his techniques and forms. 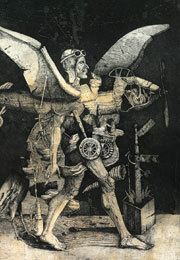 He moves from watercolour to etchings, from engravings to drawings, from black China ink to the drama of colours. The artist invents and combines places and changes registers, destroys and recreates. His artistic quest then becomes a sort of recreation of the world that he makes us view from a different perspective, in an original way, always with an element of enigma and surprise, of wonder and pleasure. Il devient désormais un artiste international. À partir de cette période son art s'enrichit et se diversifie. Il se consacre de plus en plus à la peinture sans pour autant délaisser la gravure. Ses expositions se font plus fréquentes à Paris, au Luxembourg, en Allemagne et en Australie, où il fait trois voyages qui modifieront profondément sa perception du monde. Sa découverte des aborigènes australiens enrichit et approfondit sa vision mythologique. C'est une quête des racines lointaines qui imprègne sa création, tout un monde magique ancré dans les profondeurs de l'âme humaine qui hante ses toiles. Leben und Werk Stoimen Stoilovs spannen sich vom Schwarzen Meer, von dessen Küste er stammt, bis zum westlichen Mittelmeer.Stoilov umfasst die Kultur, Kunst und Geschichte des zentralen Meeres der europäischen Zivilisation von Ost nach West, von Jasons Argonautenfahrt bis zu Odysseus’ Abstieg in die Unterwelt, von Troja bis Gibraltar, von den Griechen über die italienische Renaissance bis zu den farbenfrohen, vom Mittelmeer inspirierten Meistern der école de Paris. Aus diesem reichen Fundus an Ideen, Bildern, Gestalten schöpft Stoilov seine Visionen, die er in klassisch komponierte Bilder übersetzt. Der Künstler weiß, dass die Vorstellungen von Humanität, Proportion, Ordnung und Komposition, die von seinen Künstlerahnen seit Jahrhunderten entwickelt wurden, bis heute ihre Kraft der Überzeugung und ihre aussagekräftige Schönheit bewahrt und uns Gegenwärtigen in seiner ästhetischen und emotionalen Interpretation viel zu sagen haben.